I can never have enough garden space. And, we had a problem hillside that I just couldn’t tame. A new garden seemed like the perfect solution; but nothing is ever easy. 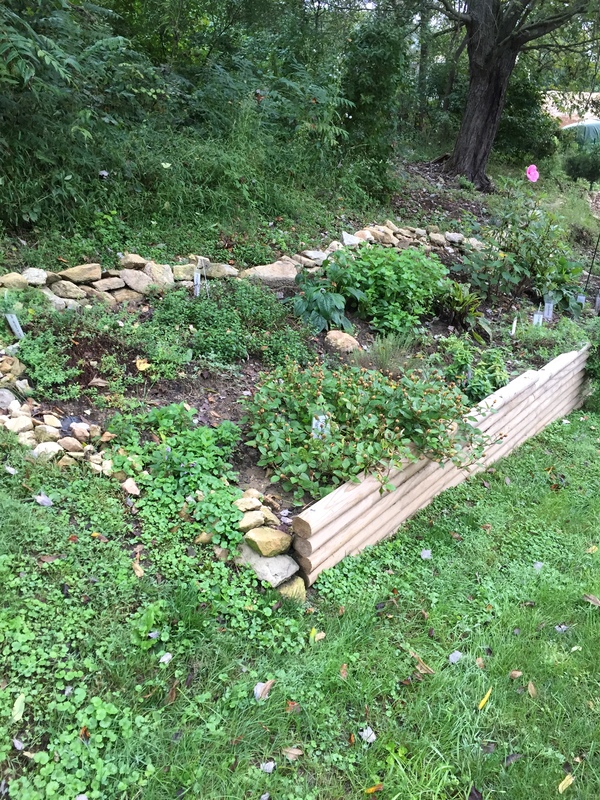 We planned a retaining wall made of landscape ties, some landscape fabric to suppress the weeds and a load of top soil to create a herb garden right outside the back door. After three trips to Home Depot for extra supplies, and a full weekend of work, it finally came together. It looks pretty good – don’t you think?! A truck load of landscape timbers – yes, the truck does come in handy. A mess of a hillside and it’s always full of weeds. It took some careful planning. Covered in landscape fabric and filled with some decent dirt. And its starting to look pretty good — better than what we started with! It filled in nicely and gave us lots of fresh herbs this summer. Now I wonder which ones will winter over. ← August – Does size matter? Definitely a keeper. Besides, he likes any project I come up with that he can use the John Deere tractor! It looks great! You certainly have a very productive farm! Thanks! Not bad for two people who don’t know what we’re doing! Nice garden ! Hey I saw the hummingbird feeder ,I have honey bees all over my feeder ! I put out a small saucer with nectar they emptied it in no time, so I Gave them (2) more. Hope that is not harmful if it is call me and I will stop ! Hi Cousin Bruce — It’s good to feed the bees, especially this time of year. Not sure what’s in your nectar – probably just sugar water? I wouldn’t give them anything with chemicals in it, but 1:1 sugar water — they will gobble it up! Keep up the good work!